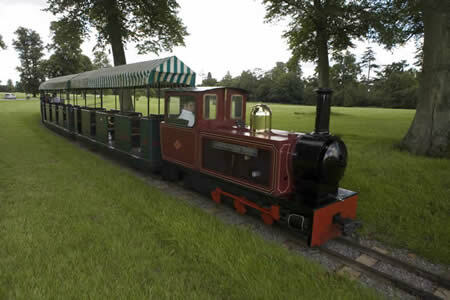 The Blenheim Park Railway first opened in 1975 and was a push/pull line operated by Pleasurerail, locomotives used being ‘Sir Winston Churchill’ built by G&SLE and for a short period 'Muffin' and 'Tracy-Jo'. The present day layout is longer and used as a transport function, carrying visitors to and from the Palace to the Pleasure Gardens. Trains are now pulled by new Alan Keef built loco ‘Winston’ with an older Keef locomotive in reserve. Fares: Park Entry Fee: Adults £12.50, Senior Citizen £9.30, Children £6.50. Train rides 50p for all, Under 5's Free. BPR Page was last updated on the 2nd March 2014 with loco list updated. © 2014 Copyright - Miniature Railway World, All Rights Reserved.